In 1587 Duke Guglielmo Gonzaga of Mantua died, and was succeeded by his son Vincenzo I. This resulted in a drastic change of the cultural climate at the court. Whereas Guglielmo had a rather conservative taste, Vincenzo was open to the modern trends in music. Vincenzo was in close contact with the courts of Florence and Ferrara, in particular since his sister married to Duke Alfonso II d'Este of Ferrara and he married Leonor' de Medici from Florence in 1584. In around 1590 Monteverdi arrived in Mantua, where he started to be active as a madrigal singer. In 1592 he published his Third Book of Madrigals, which shows the traces of the new climate at the Mantuan court. One of these is the use of texts by Tasso and Guarini, the two famous poets with whom Vincenzo became friends in Ferrara. The second is that in some madrigals there are extensive passages for the three top voices, perhaps a reference to the famous 'Concerto delle Damme' which was active at the Ferrarese court, and which Vincenzo greatly admired and wished to copy at his own court. In a number of madrigals of the third book Monteverdi points in the direction of the 'seconda prattica', in particular in the two cycles 'Vattene our, crudel' and 'Vivrò fra i miei tormenti' which contain a number of strongly declamatory passages. This forward-looking character of the third book could explain its popularity: thirty years after its first appearance it was still reprinted, which is remarkable in a time of fast-changing tastes. The book opens with a rather moderate madrigal, which is considered a tribute to the man the book was dedicated to: Vincenzo I. The reason for this is obvious: Giaches de Wert, 'maestro di cappella' at the ducal chapel of Santa Barbara was regularly ill, and Monteverdi was hoping to succeed him. Some madrigals are very virtuosic, in particular those which contain passages for the three upper voices. There is a lot of madrigalism and chromaticism and dissonances are used to illustrate parts of the text as well as shifts in tempo. The performance by the ensemble Delitiae Musicae does full justice to the imaginative settings by Monteverdi. Last year I became acquainted with this group's interpretations of Monteverdi's madrigals, and I was enthralled by the recording of the second book. I can be just as enthusiastic about the present disc: the change in the top of the ensemble since then - the alto Paolo Costa has been replaced by Fabian Schofrin - hasn't changed the fine sound of the ensemble as a whole. In the booklet Marco Longhini quotes additional support for his decision to use only male voices for his recordings. Another feature which sets this performance apart from most others is the use of instruments. Whereas in the second book the ensemble included a 'basso di viola', two lutes and a harpsichord, here only a theorbo and a harpsichord are used in some of the madrigals. They provide a 'basso seguente' accompaniment. The original publication didn't contain a 'basso continuo' part; this was only added in the publication of the third book by Phalèse in Antwerp in 1615. 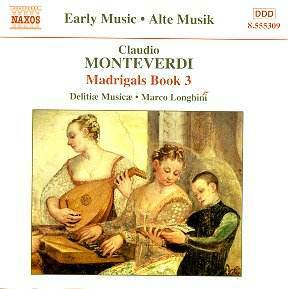 As far as I am concerned, the recordings of Monteverdi's madrigals by Delitiae Musicae belong to the best available. Hopefully the ensemble will be able to record the remaining books in due course.